How Do I Help My Kids Prevent Ingrown Toenails? The best offense is defense! To stop the occurrence of painful ingrown toenails, you should do your best to avoid some of the usual causes. Here are the best ways to prevent this common condition. Ever notice your kiddos are growing like weeds? Their toenails can, too! If you’re tempted to cut your child’s nails back as far as possible to lessen the number of times you have to wrestle them into submission while trimming their nails (kids seem to grow an extra 6 or 8 limbs every time they have to do something they don’t like, am I right? ), let us stop you right there! Nails should not be cut too short. This increases the risk of your child developing an ingrown nail. Rather, clip nails so a thin line of the whites of the nail remains. Also, make sure the nail is cut straight across – don’t attempt to round the edges. If the edge of the nail is sharp, use an emery board or nail file to soften it. Kids seem to blow through shoes at an impressive rate. If they aren’t growing out of them in a few months (or even weeks! ), they seem to beat them up enough that laces break, holes develop, and sometimes even the seams rip! 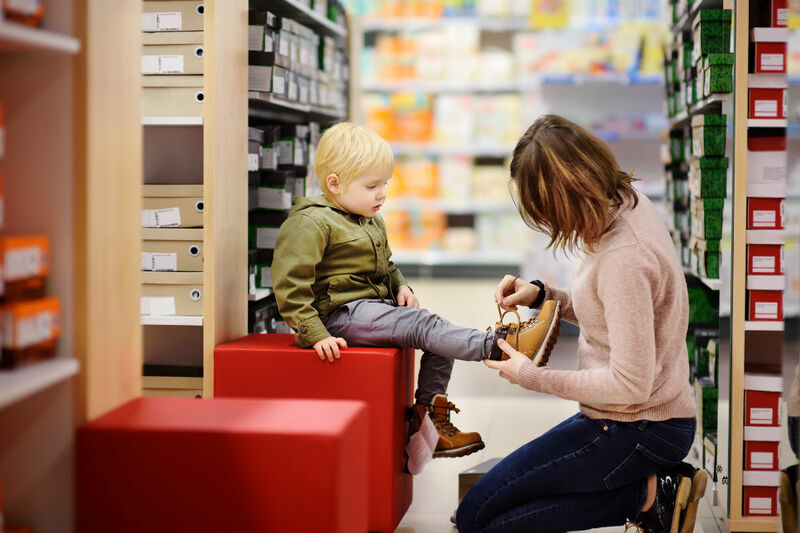 If a pair survives the daily stresses of running around, it might be tempting to keep your child wearing their favorite kicks even if their toes are touching the front of the shoe. However, one common cause of ingrown toenails is improper fit of shoes (or other footwear – we’ll get to this in a minute). Make sure you take your children with you when you shop for their shoes! Getting the right fit requires actually trying the shoes on the feet that will be wearing them. The heels should fit snugly, and not slip. Toe boxes should not pinch your child’s toes, and there should be about a finger’s width space between the longest toe and front of the shoe. Now, about that “other footwear” we mentioned. This potential cause of ingrown toenails essentially boils down to undue pressure on your child’s toes. This can obviously happen with too-tight shoes, but can also occur with something like socks or even pajamas with feet! Just make sure no matter what’s on your child’s feet, their tootsies have plenty of room to wiggle and move! With all the other health concerns you need to keep an eye on when it comes to your kids (making sure they’re eating right, sleeping enough, not falling off the roof when trying to fly), checking their feet probably falls to the bottom of the list. However, a daily check of your child’s feet can reveal a lot about their health, and can help prevent ingrown toenails. If you see red or swollen skin, or your kiddo’s feet are sensitive to touch, you might have a problem! Other signs could indicate an issue we covered above, too. Blisters might indicate improperly fitting shoes, or bleeding nail beds might indicate your child’s nails are too short! Take a minute every morning or night to take a peek at your child’s feet. Of course, our primary advice is to bring your child in to see a podiatrist! And that isn’t just because we are podiatrists. The main reason to have an expert treat your child’s ingrown toenails is to avoid possible complications. A “simple” ingrown toenail can become infected, or can lead to an even bigger wound that may take longer to heal. Soak your kiddo’s feet in warm water for 15-20 minutes, 3-4 times per day. This will soften the nail and skin to relieve swelling and discomfort. After soaking their feet, you can take a soft cotton pad and place it under the ingrown nail. This will help the nail grow above the skin (as opposed to into it). If the skin around the nail is broken, apply antibiotic cream to prevent the possibility of infection. If your child’s ingrown toenail does not resolve itself after treatment at home, or becomes a recurring problem, absolutely make an appointment to see a podiatrist. We have extensive experience treating children of all ages, and would be honored to help get your little ones back on their feet and feeling great! When an ingrown toenail is a recurring problem, we have the option of removing a section of the nail so future issues don’t arise. For more information simply call 407-339-7759 or 352-589-9550 (if calling from Lake County) or feel to request an appointment with any of our five Central Florida offices online right now. We look forward to seeing you and your kids in one of our convenient locations!